What’s next for A Series of Unfortunate Events? Executive producer Barry Sonnenfeld says season two of the Netflix series is already being written, Variety reports. 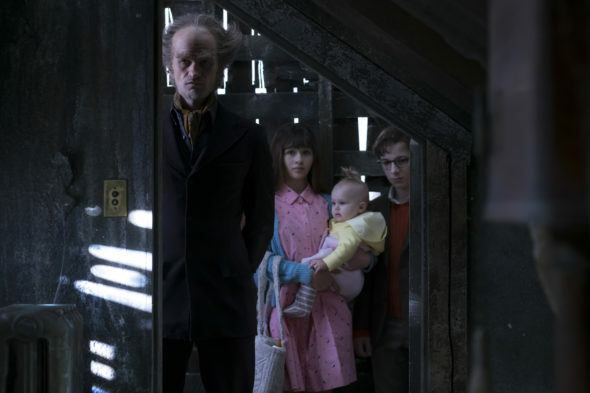 Based on the book series by Lemony Snicket, the show follows the three Baudelaire orphans, who are sent to live with their eccentric relative Count Olaf (Neil Patrick Harris) after their parents die. The cast also includes Patrick Warburton, Catherine O’Hara, Aasif Mandvi, Alfre Woodard, Joan Cusack, Malina Weissman, and Louis Hynes. Season one debuted today, January 13th. Netflix has not yet officially renewed A Series of Unfortunate Events for a second season. What do you think? Have you started watching A Series of Unfortunate Events? Do you want more seasons? More about: A Series of Unfortunate Events, A Series of Unfortunate Events: canceled or renewed?, Netflix TV shows: canceled or renewed? The books are wonderful, in a non wonderful way. We love how the show is bringing this story to life! We want lots more. We will be done reading soon and ready to watch. I have read all of the books and I wish they would hurry and come out with season 2!!!! Love it! Sunny is adorable! Also of course love the kids and how smart they are. Neil Patrick Harris really make the show too. Much better than Jim carry. Its a Joy to what and I hope to see another season! Much better than the Jim Carrey version. I enjoy shows that follow the books. I’m excited to see all the books recreated in this series. And that baby Sunny is superb! I like to just watch her facial expressions during the scenes. She’s adorable.